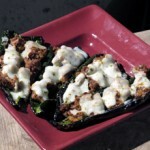 This recipe by Mark Masker appears on the Burn! Blog here. The sausage recipe for this is one I found in Charcuterie: The Craft of Salting, Smoking, and Curing. I tweaked their version a little bit with the habanero peppers. It’s the first thing I made in my grinder, and everyone agreed it was the best chorizo they’d ever tasted. Combine everything except the tequila and vinegar. Toss it to distribute the spices, then chill it until you’re ready to grind. Grind the mixture through the small die into a bowl set in ice. When that’s complete, mix in the vinegar and tequila into the ground meat using either a really sturdy spoon or a hand mixer with a paddle attachment. You know you’re done when the sausage has uniform color and a sticky consistency. It should take one minute on medium speed. Set aside two pounds for the stuffed peppers. Do whatever you want with the rest. Just bear in mind that this stuff is long on yummy, short on preservatives. Store it in your fridge or freezer appropriately if you don’t use it right away. I wouldn’t keep it in the freezer more than month or so, but I had a bad experience with some bad hamburger in college, so I’m psycho about freshness in my dead animals. Heat your grill up to medium hot. Wrap two pounds of the chorizo in foil for grilling. Place the pepper halves inside-down on the grate. Cover, then check every 6 minutes until the color changes to a more olive green. Check the chorizo while you’re looking at the peppers. If it cooks faster than the pasillas, move the sausage to indirect heat to keep it warm while the peppers finish. Flip the peppers over and repeat the process. 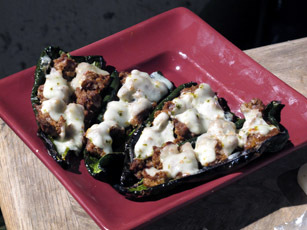 Move them to indirect heat, fill them with scoops of the cooked sausage, then place a slice of cheese atop each one. Shut the lid and let the peppers be just long enough for the cheese to melt. Put them on a plate and top them with little dollops (or heaps, your choice) of guacamole.